Bladder outlet obstruction can be associated with lower urinary tract symptoms (LUTS) or can remain “silent” leading to secondary conditions such as urinary tract infections, bladder diverticulum, bladder stones or renal failure. Categorizing and understanding these entities is crucial when proceeding with a LUTS evaluation as specific diagnostic modalities may then be used to fully delineate the degree of BOO and any secondary issues. Urodynamic evaluation and pressure flow evaluation is the gold standard diagnostic tool. The AUA Guidelines on Urodynamics in Adults state that “the pressure flow study remains the only means of definitely establishing or ruling out the presence of BOO in men.” It is important for clinicians to recognize the urodynamic findings seen in both men and women with outlet obstruction due to variety of pathologic conditions and to be able to identify both the value and limitations of urodynamics in the evaluation of LUTS. 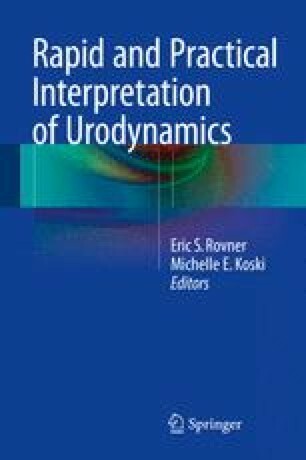 This chapter provides a number of urodynamic tracings from patients who presented as outpatients with bothersome LUTS. Urodynamics were obtained as part of their evaluation and we review each of the tracings in the context of the particular patient’s history and physical exam findings.